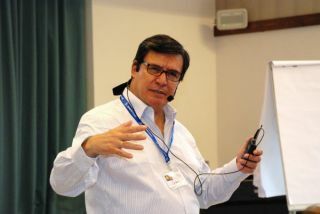 The main speaker of the seminar was the Ecuadorian socio-psychologist Galo Pozo Almeida, friend and supporter of Sportmeet, management consultant of big companies working in Ecuador and in Latin America. What is high performance? How is it possible to reach it? By adopting which method? These are just a few questions to which the participants could find an answer, thanks to an original teaching approach proposed by professor Almeida. The frontal lessons in the meeting room, aimed at grasping the theory and at defining the concepts, were constantly accompanied by group work, debates and personal exercises for focusing and planning goals. Among the participants also Giuseppe Vercelli (psychologist of the national team of downhill skiing and that one of kayaking, and responsible of the Juventus University project) was present. He expressed the importance of having clear goals in mind, in sport as well as in life, and valid methods to achieve them. “The positive result is a combination of thoughts, feelings and actions – stated Almeida in conclusion of the seminar – the high performance demands a life project, the prediction of a future. The desire to conquer something great is necessary, but not enough. Winning people know where they want to get and take little steps, with a method, towards the achievement of each stage to the goal, by overcoming obstacles and controlling fear.The winning instinct inside all of us will bring us to give out and spread our resources, because we are planned to share”.